9th of June for Barbon I think? Apologies everyone completely forgot to update the thread. Had an absolutely amazing first pedal at Scammonden with Ray the weekend previous. Possibly the steepest hill I've seen so far. In the dry it was very grippy but you could feel undulations and runs in the tarmac, making traction critical. I think nearly everyone run apart from one a rear wheel was picked up causing the limiter to nailed before catching up. Really chuffed with the times me and Ray set. On the pace for the class out of the gate and chasing down the current record. Was over the moon to find I took the class and record (although unofficially due to the timing equipment). Can't wait to get back out there. Last edited by mtunreal; 05-30-2018 at 07:03 AM. Apologies for the delay in updates. Busy week at work. Last weekend was excellent. Barbon is a stunning place and much like Scammonden its only a few bends, but bloody hell they are some fun bends. Haven driven over 300 miles across the country, managed to pick up two 1st places and set a new PB at Curborough. Really chuffed with the results. Looking forward to being back out at Aintree in a few weeks time. Hoping to improve on the previous times with a bit of track knowledge and bedded in tyres. im not doing much with the S2K this year but a week and a half ago the was a evening event at Rockingham called Summer Social, i was fed up with work and personal stuff so i decided to take a trip over to Rockingham and have a look what is going on. The event started at 5.30pm and finished at 8pm, i didnt leave Wolverhampton till abut 5.30pm and it was a 80 mile one way trip, got there at 7.15pm parked up, a few people came over and got talking ( cool guys that was running a Micra that day ) and the guys mentioned the sprint track why not lets have a go £10 for 3 laps and a practice. 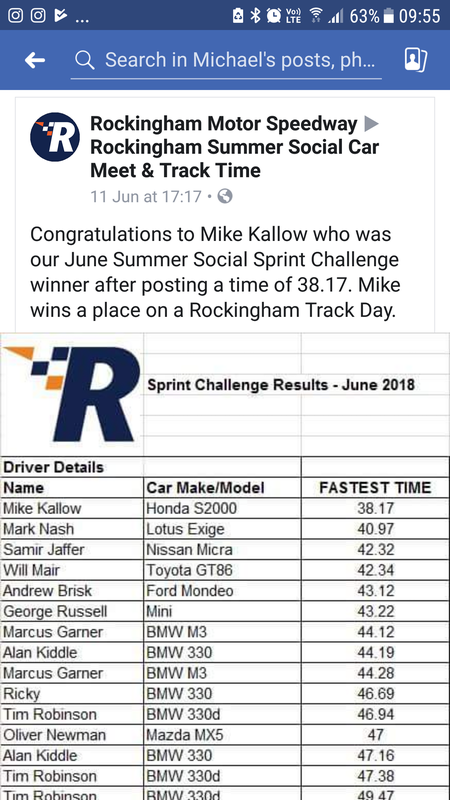 So had a few runs and ended up taking the top spot and a free entry to a Rockingham trackday, which actually cheered me up a bit and got my focus back to do more and have a go at some new stuff an eventful trip out.